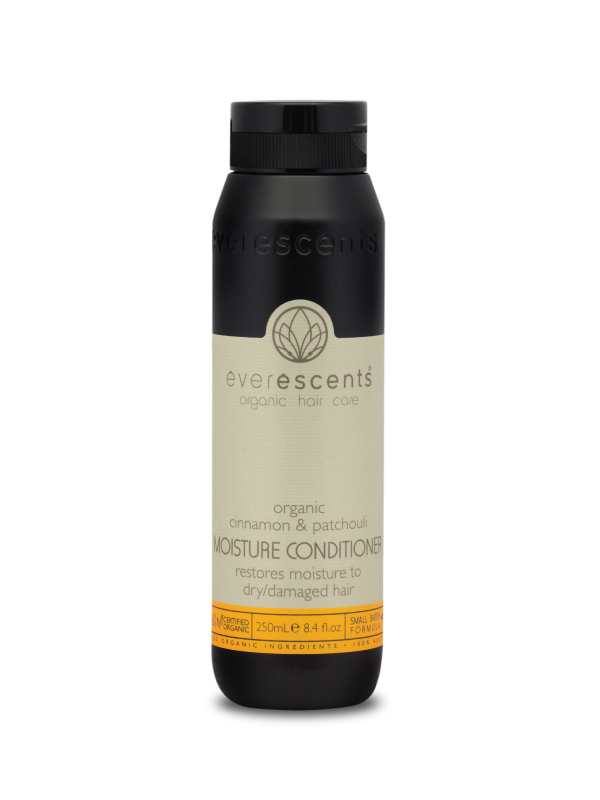 The EverEscents Cinnamon & Patchouli Moisture Organic Conditioner will be sure to revitalise even the most damaged hair type! A high moisture formula enhanced by Lexfeel Natural (a natural castor oil emollient) will ensure that your hair is left feeling revitalised and nourished. 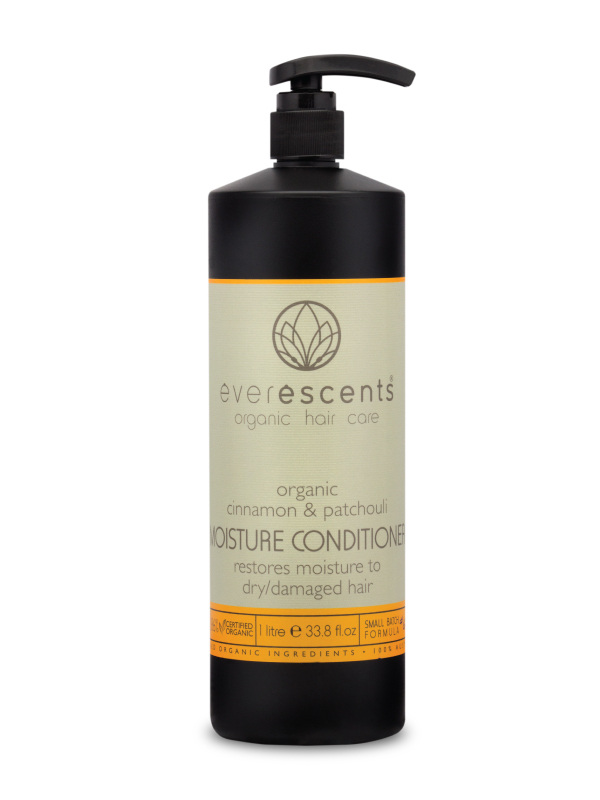 With the added benefits of Certified Organic herbal extracts and essential oils sourced from the highest quality Australian farmers, it is perfect for healing hair affected by chemical processing and colour treatments. Designed for dry & damaged hair. Chamomile, Birch, Horsetail, Rosemary, Sage, Linden, Nettle, Yarrow, Vanilla, Vetiver, Patchouli and Cinnamon. Skin & Hair – Vetiver stimulates and tones skin, increases blood flow, is nourishing and helps improve a dry scalp. Mind & Spirit – Vetiver has a refreshing and cooling action and is beneficial in relieving headaches. Skin & Hair – Cinnamon stimulates circulation and new cell growth and aids in tissue regeneration. 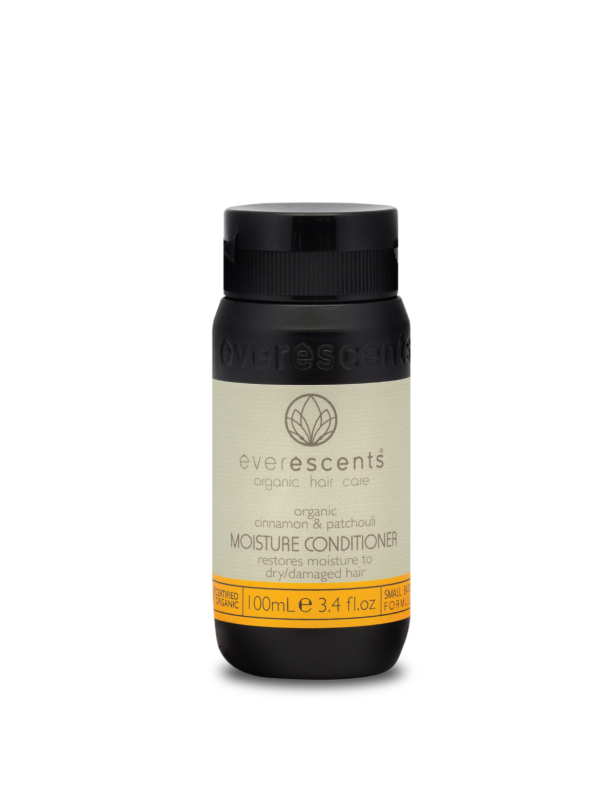 It aids with scalp conditions such as flaky scalp and psoriasis. Mind & Spirit – Cinnamon can help relieve headaches, colds, nausea and is believed to improve energy & vitality. Aqua** (Purified Water), Sorbitol** (moisturiser), Vegetable Glycerin** (moisturiser), Behentrimonium Methosulfate** (mild detangling agent derived from canola), Cetyl Alcohol** (plant derived emulsifier), Butylene Glycol** (naturally derived humectant), Cetearyl Alcohol** (plant derived wax – detangling and thickening), Heptyl Undecylenate* (natural castor oil emollient), Rosmarinus Officinalis Leaf Extract* (Rosemary), Sage Officinalis Leaf Extract* (Sage), Tilia Cordata Flower Extract* (Linden), Urtica Dioica Extract* (Nettle), Betula Alba Extract* (Birch), Equisetum Arvense Leaf Extract* (Horsetail), Achillea Millefolium Extract* (Yarrow), Vanilla Plantifolia Fruit Oil* (Vanilla), Vetiveria Zizanoides Root Oil* (Vetiver), Pogostemon Cablin Oil* (Patchouli), Cinnamomum Zeylanicum Leaf Oil* (Cinnamon), Citric Acid** (natural preservative), Sodium Levulinate & Sodium Anisate** (natural preservative derived from non-GMO corn and fennel), Glyceryl Caprylate** (Co-emulsifier, naturally derived from glycerin and coco-fatty acids). To achieve healthier and more luminous results Soulstyle Organic Hair use the Italian brand called Colour Herbe. 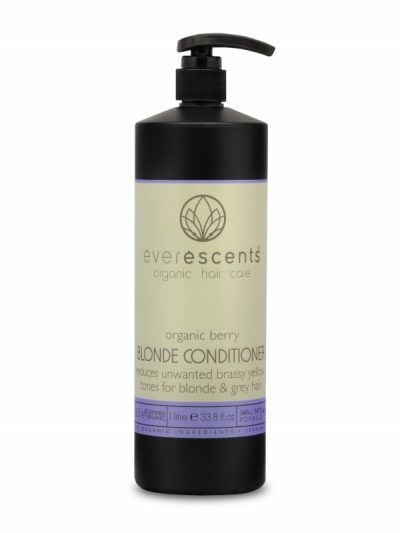 Colour Herbe is a beautiful organic colouring system that utilises proteins, botanicals and natural vegetable extracts as well as organic clay lighteners for blondes to lighten pigments without damaging or stripping hair.